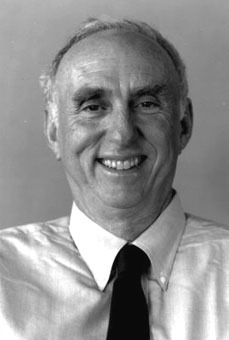 American physicist Martin L. Perl discovered the tau lepton, a heavy lepton with a mass greater than the proton and the first known member of the third quark-lepton family, in 1974. The tau lepton is a subatomic particle similar in some regards to the electron, but several thousand times heavier and far shorter lived. When Perl began his work, scientists knew of only four leptons: electrons, muons, and their corresponding neutrinos. The last known lepton had been discovered in 1936, and when Perl used the new Stanford Positron-Electron Asymmetry Ring (SPEAR) at Stanford University to search for further leptons it was considered a largely theoretical exercise. The tau lepton is now known to be a fundamental building block of matter, and its discovery added to the evidence supporting the Big Bang theory. Perl was awarded the Nobel Prize for Physics in 1995, sharing the honor with Frederick Reines, who discovered the neutrino.